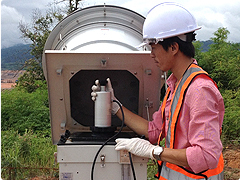 PM10 samplers were installed and operated since July 2011 at 6 locations. These samplers will be handed over to GoL after completion of the Continuously Air Quality Monitoring Station (AQMS) installation. Noise 5 locations (August 2010) – Permanent sound level measure instruments are installed to monitor at the receptors near power plant and mine activities. 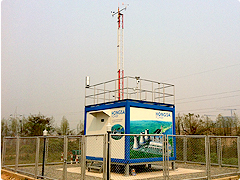 Three continuous Air Quality Monitoring Stations (AQMS) were installed and started monitoring for the particulate matter less than 10 micron (PM10), Sulfur Dioxide (SO2), Oxide of Nitrogen (NOx), Wind Speed, Wind Direction, Temperature, Relative Humidity, and Barometric Pressure; and shall continue operating throughout the Concession Period.